As the FIFA Under 17 Women’s World Cup continues in Uruguay the Sunflower Women’s Football Club from Hammarsdale has four players representing their country in the global showpiece. The Sunflower Women’s FC has recently become part of the KZN Department of Sport and Recreation-backed Elite Athlete Development Programme and Yenzokuhle Ngubane, Sphumelele Shamase, Thubelihle Shamase and Yolanda Nduli are all playing their part in trying to get a historical first win at the tournament. Bantwana, as they are affectionately known, played to a goalless draw with Mexico in their opening game of the competition but went down to Japan in their second group game. They have a final group assignment against Brazil on Tuesday. The four players from the Sunflower Women’s FC were all members of the team, funded by the City of Durban, that took part in the 2016 One Nations Cup tournament in Germany. This year Yolandi Nduli took part in the One Nations Cup tournament in Japan as well. Nduli was voted as the Diski Queen for the 2017 Sasol League National Championships at the age of 14. “These girls have all played on the international stage so the World Cup should not be seen as a new stage but rather as a continuation of their international exposure,” the club consultant Lona Benya said. 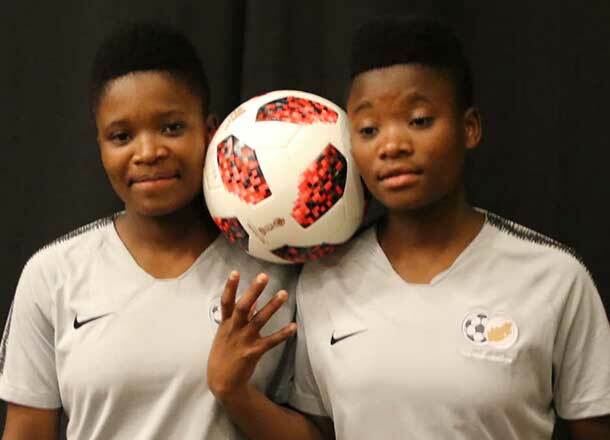 Sphumelele Shamase and Thubelihle Shamase are twins who have defeated significant odds since their mother passed away when they were two months old. The pair has been raised by their grandmother since.